Another couple was caught red-handed in the grass lands! Home / Life / Another couple was caught red-handed in the grass lands! It is for real that in this generation, more and more people are getting too clingy to their partners. What's worse is that some people are going over the 'cuddl*ng' in public places. If you have a boyfriend or a girlfriend, would you allow him/her to do more than cuddl*ng in a public place? Recently, a lot of couples are being caught red-handed in different public places, may it be a public vehicle, a parking lot, an open field and now, even in the rice fields! 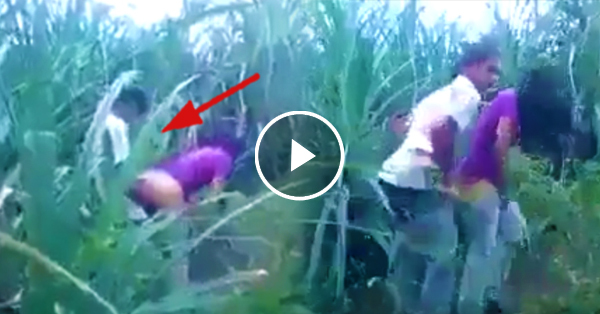 In this short clip, a man was slowly walking in the rice fields as if he was following someone. After a few moments, he spotted a couple doing IT in the rice fields! The couple was obviously shocked when they found out that they doing IT in the grass lands just to satisfy their cravings! A lot of people quickly reacted to this viral video by saying that they find the couple's reaction, hilarious!